The insurmountable glories of this Ekadasi are given in the Skanda Purana. Maharaj Yudhistira once enquired from Sri Krsna, "O my Lord, O Krsna, please show your mercy unto me by describing the Ekadasi that comes in the month of Phalguna. Yudhisthira Maharaj said, "Oh Lord Sri Krishna, O glorious son of Vasudeva, please be merciful to me and describe the Ekadasi that occurs during the dark fortnight of the month of Phalguna (February-March)"
Lord Sri Krishna replied, "Oh Yudhisthira, Oh king of kings, gladly I shall tell you about this great fast, known as Vijaya Ekadasi. Whoever observes it certainly achieves success in this life and the next. All the sins of one who fasts on this Ekadasi and hears its sublime glories are eradicated. "Narada’s great father then replied, ‘My dear son, this oldest of fasting days is pure, and it nullifies all sins. I have never revealed this to anyone until today, but you can understand beyond any doubt that this Ekadasi bestows the result indicated by its name… (Vijaya meaning Victory). "When Lord Rama was exiled to the forest for fourteen years, He, the goddess Sita, and His divine brother Lakshmana stayed at Panchavati as mendicants. Mother Sita was then kidnapped by the demon Ravana, and Lord Rama seemingly became bewildered like an ordinary man by distress. 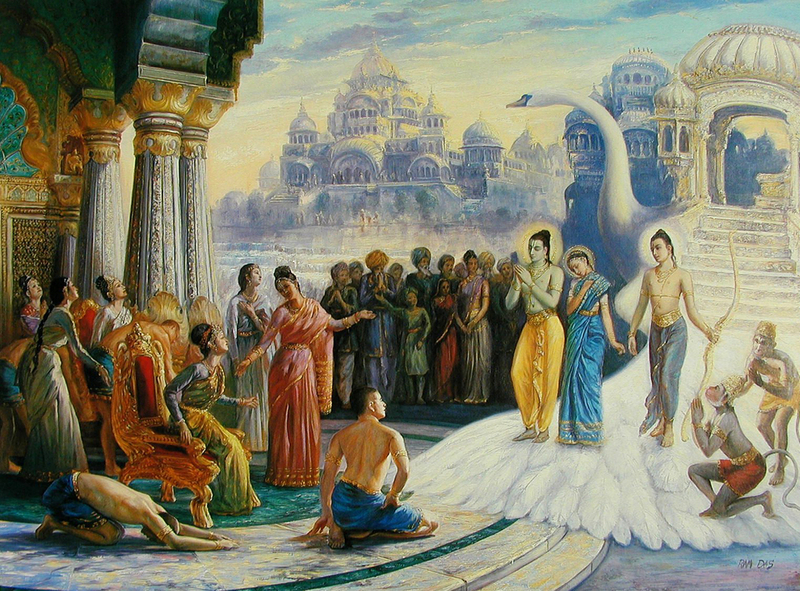 While searching for His beloved consort, the Lord came upon the dying Jatayu and thereafter killed His enemy Kabandha.. The great devotee-vulture Jatayu returned to Vaikuntha after telling Rama how His dear Sita had been abducted by Ravana. "Later, Lord Rama and Sugriva, the king of the monkeys, became friends. Together they amassed a grand army of monkeys and bears and sent HanumAnji his minister to Sri LankA, where he was able to see Janaki (Srimati Sita devi) in an Ashoka grove garden. He delivered Lord Rama’s message and showed the ring proving his authenticity for rendering such great service to the Supreme Lord Sri Rama. "With the help of Sugriva, Lord Rama proceeded toward Sri Lanka. Upon arriving at the shore of the ocean with the army of monkeys, He could understand that the water was uncommonly deep and hostile. Thus He said to Lakshmana, "Oh son of Sumitra, how can We earn enough merit to be able to cross this vast ocean, the unfathomable abode of Varuna deva? I can see no easy way to cross it, teeming as it is with sharks and other ferocious aquatics." "Lakshmana replied, "Oh best of all beings, Oh origin of all the devas, Oh primal personality, the great sage Bakad Albhya lives on an island just four miles from here. Oh Raghava, he has seen many BrahmAs come and go, so aged and wise is he. Let us go to him, take his darshan (audience) and ask him how We can safely reach Our goal." "So Rama and Lakshmana proceeded to the humble Ashrama of the incomparable Bakad Albhya Muni. Approaching him, the two Lords paid Their respectful obeisances to him as if he were a second Vishnu. Bakad Albhya could immediately understand, however, that Sri Rama was actually the Supreme Personality of Godhead, who for His own reasons had appeared on the Earth and was enacting just like a human being. "Rama, " said BakadAlbhya, "Oh best of the human beings, why have You come to my lowly abode?" "The Lord replied, "Oh great, twice born brahmin, I have come here to the ocean shore with My phalanx of monkey and bear warriors in order to cross the sea and conquer LankA and its demon horde headed by Ravana. Oh greatest of sages, please be merciful unto Me and please tell Me how I can cross this vast ocean. That is why I have come to your Ashrama today." "The sage said, "Oh Lord Sri Rama, I shall tell you of the most exalted of all fasts, observing which You will surely conquer Ravana and be eternally glorified. Kindly now listen with full attention. "On the day before Ekadasi, fashion a water pot of gold or silver, or even copper. Even clay will do if these metals are unavailable. Fill the pot with pure water and then decorate it nicely with mango leaves. Cover it and place it near a holy altar upon a mound of seven grains (the seven grains are barley, wheat, rice, corn, chickpeas, kukani, and dahl or peas). Now take Your morning bath, decorate the water pot with flower garlands and sandalwood paste, and inn the concave lid atop the pot place there the barley, pomegranate, and coconut. Now with great love and devotion worship the water pot Deity form and offer Him incense, sandalwood paste, flowers, a ghee lamp, and a plate of sumptuous foods. Remain there awake that night beside this sacred pot. On top of the lid filled with barley, etc., place a golden murthy of Lord Sri Narayana. "When Ekadasi dawns, take Your morning bath and then decorate the water pot with fine sandalwood paste and garlands. Then worship the pot again with first class incense, lamps, sandalwood paste and flowers dipped in sandalwood paste, and then devoutly/devotedly place many kinds of cooked food, pomegranate, and coconut before the water pot. Then remain awake over night. "When the Dwadasi dawns, take the water pot to the bank of a holy river, or even to the shore of a small pond. After worshipping it again properly, Oh King of kings, offer it with all the aforementioned ingredients to a pure hearted brahmin, expert in the Vedic sciences. If You and Your military commanders observe the Vijaya Ekadasi in this way, You will surely be victorious in every way." "Lord Sri Ramachandra Bhagavan, the Supreme Personality of Godhead, did just as Bakad Albhya Muni instructed, and thus He conquered all demoniac forces. Similarly, anyone who observes the Vijaya Ekadasi in this way will always be victorious in this mortal world, and after leaving this world he/she will reside forever in the anxiety free realm of the Kingdom of God known as the Vaikunthas." "Oh Narada, my son, from this history you can understand why one should observe this Ekadasi fast properly, strictly following the rules and regulations. This fast is powerful enough to eradicate all one’s sinful reactions, even the most abominable ones." Lord Sri Krishna concluded, "Oh Yudhisthira, anyone who reads or hears this history will attain the same great merit as that which is earned by performing a horse sacrifice on days of yore." Thus ends the narration of the glories of Phalguna-krsna Ekadasi or Vijaya Ekadasi, from the Skanda Purana.